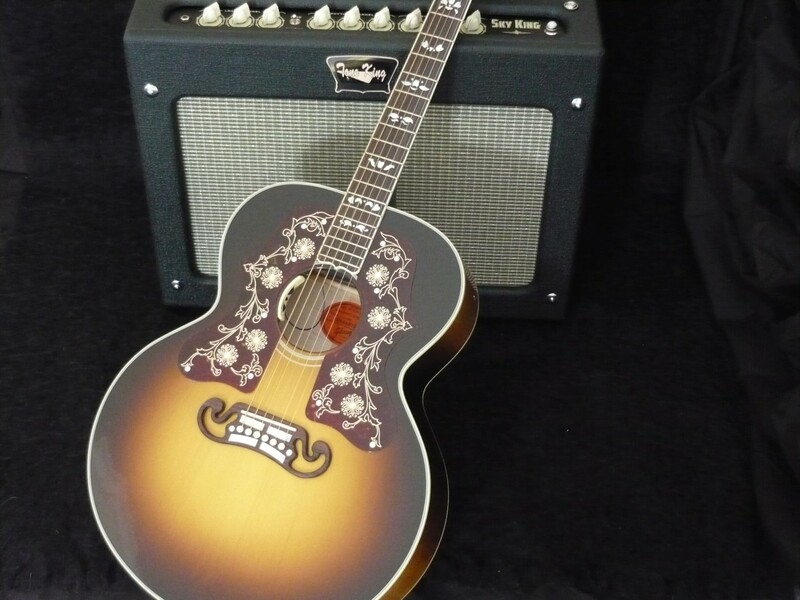 2014 Brand New LIMITED EDITION Gibson Super Jumbo Acoustic Bob Dylan SJ-200 Player's Edition - Custom Model - Vintage Sunburst 6-string Acoustic-electric Guitar with Adirondack Red Spruce Top, AAA Flame Maple Back and Sides. The Gibson Acoustic Bob Dylan SJ-200 Player's Edition guitar was modeled after Bob Dylan's classic SJ-200. The first thing you'll notice about this eye-catching guitar is the dual engraved tortoise pickguards. The rosewood fretboard feels great thanks to its rolled edges and looks great with mother of pearl Bella Voce inlays. Gibson Acoustic used premium AAA flame maple for the back and sides with Adirondack spruce for the top. Gibson Acoustic's Bob Dylan SJ-200 Player's Edition is loaded with a feedback-busting, natural-sounding pickup - the LR Baggs Anthem. There's no modeling and no illusions going on here. The Anthem is strictly a well-designed microphone that picks up your SJ-200 - clean, clear, and full of dynamics. While many guitar mics are way too prone to feedback or just as bad... give you that annoying "boxy sound" when used alone, the LR Baggs Anthem is like having your acoustic sound just "turned up," so it's full of detail, warmth, and personality.